I stayed up too late last night, and things feel a little loud and a little too bright this morning, even though the sun isn’t up yet…but I finished The Book! 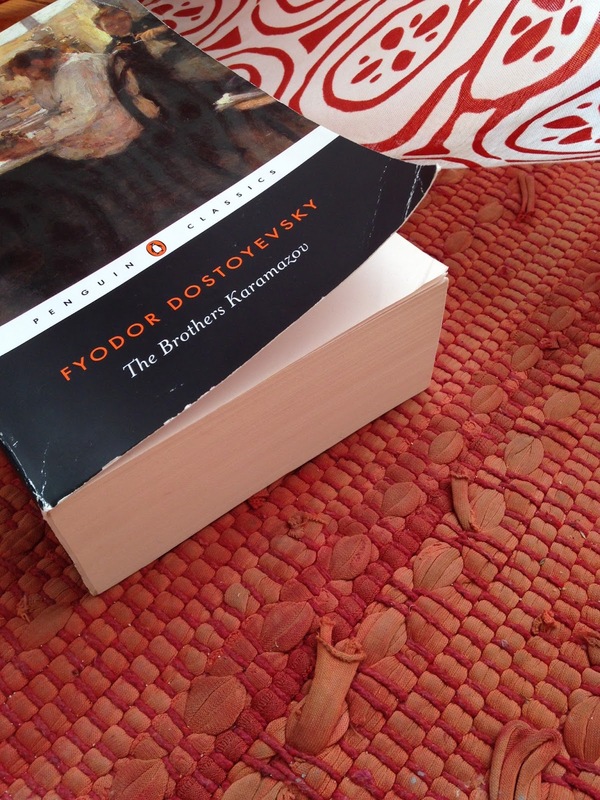 I’ve been reading The Brothers Karamazov since May, I think, but it feels like forever since the sight of its cover didn’t cause a twinge of guilt. How many other books have I not read in the time I’ve been slogging my way through this one? It’s more than a handful, I am sure. I always have multiple books going at once, so I didn’t feel bad about reading other things on the side. This is a heavy read and a long-term commitment. At some point, though, I realized that I was avoiding reading altogether because I felt bad about not wanting to read this book. I wanted to have read this book, yes…but the actual reading of it was not something I enjoyed. Then, yesterday, the Kindle app on my phone informed me that I had crossed the 89% mark. Suddenly, I couldn’t put it down. The end was in sight! I read whenever I could squeeze in a few minutes (including a little while where I hid from my kids on top of the dryer in the laundry room), and I have finally finished. What do you do when you really want to have read something but just aren’t enjoying the process of reading it? I once watched a movie instead of reading a book (for 12th grade AP English, Joseph Conrad’s Heart of Darkness) but I felt so guilty about it that I went back and crammed the book in later before the exam. These days, I love descriptive language too much to substitute a movie for a book (and am always afraid I would miss some important detail that way). Still, sometimes I struggle to fit reading in with everything else I’m doing, no matter how much I want to do it. When I’m committed to reading a challenging book but am having a hard time finishing it, I have several strategies. 1. No guilt. 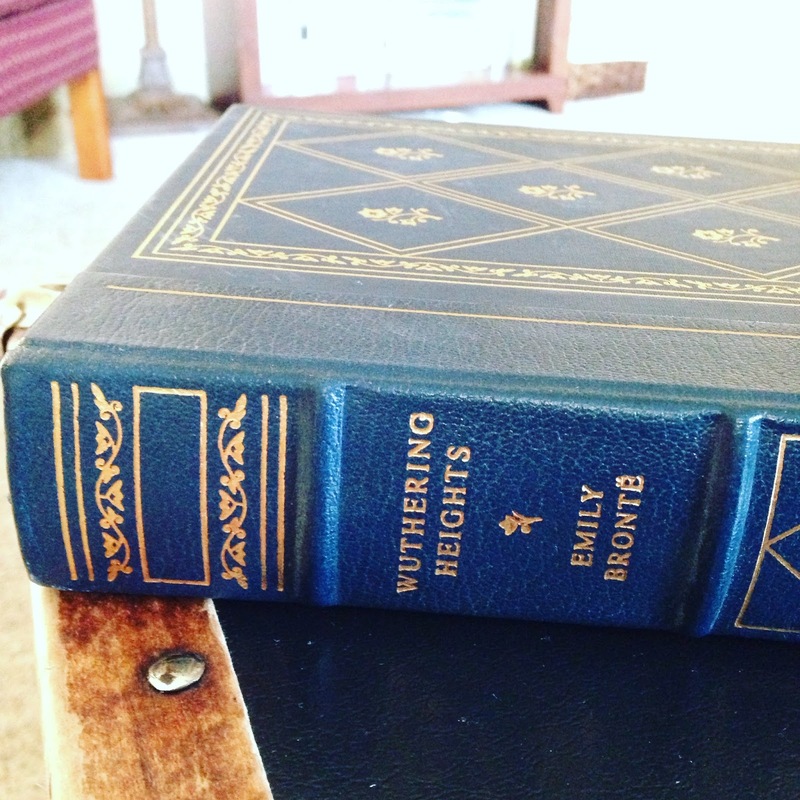 If a book isn’t worth it right now, I have no problem ditching it for another one. My reading time is precious. I used to be the kind of reader who always finished her books, no matter what…but these days, I’m okay with leaving one behind if it isn’t working for my life right now. 2. I’m not married to my hardback copy. I get through really long reads by reading bits and pieces on the Kindle app on my phone while watching children ride their bikes on the driveway or waiting for them to fall asleep. It can be a pain to switch back and forth between an electronic and paper version, but if it means I get to keep making forward progress, it’s worth it. 3. Audio books save me. I listen to Librivox or Audible recordings in the car (if I happen to be by myself, which rarely happens, or if the children have fallen asleep) or at home while I’m doing the dishes or folding laundry. If I’m on a deadline (book club meeting this weekend! ), I try to keep the book nearby so I can use all my spare minutes to finish it. Sometimes, this ends up leaving me with a fragmented feel, like I didn’t have enough long stretches of time to really sink in to the story and the characters…but this is how I can read right now. I don’t have really long stretches of uninterrupted time to do much of anything, including sleep. During certain seasons in life, you have to take what you can get where time is concerned. 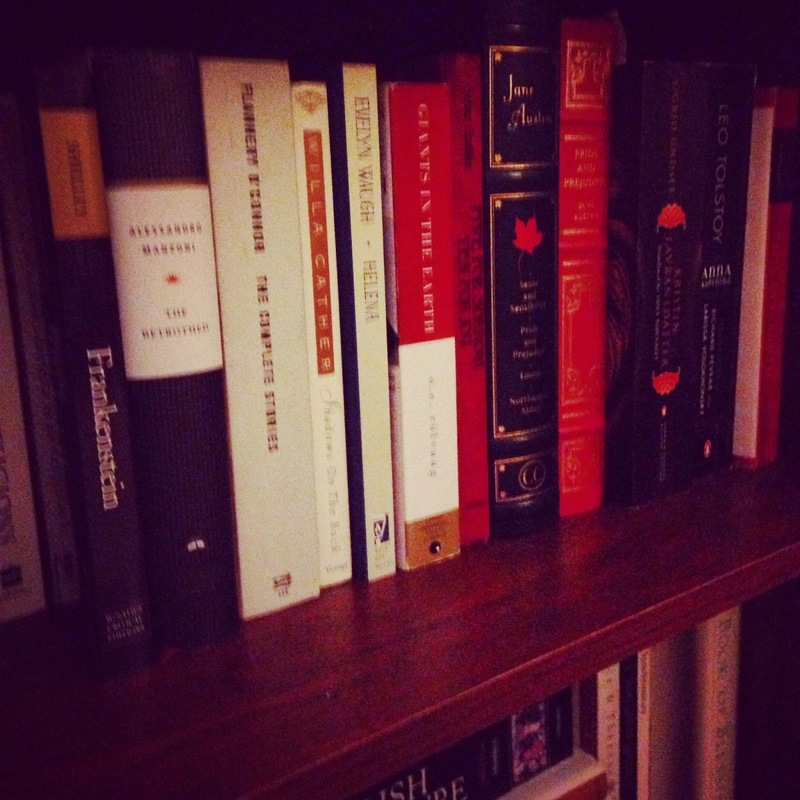 Tell me, because I want to know- when/where/how do you read? And what are you reading now? Five-Minute Friday this week is HERE. When I look around here, sometimes all I can see is the mess. There are Legos trickling out into the hallway from Sam’s room, and there’s toothpaste on the wall outside the bathroom. I’m not even going to look in the sink. A tiny plastic pig is lying under the kitchen table, stranded on his back with four stick-like legs pointing helplessly into the air. He’s been there all day. I’m not sure anyone is coming to save him. There are remnants of Spartan battle attire and swords made from PVC pipe littering the bathroom floor, and someone’s rainbow sock is on the front porch. I have no idea where the other sock is. It is easy to see the mess here. It would be easy to let the mess be the only thing I see. But tonight, I look at a wiggly, giggly tangle of arms and legs here on the sofa, and I see more. They’re crowded around a book, as they always are this time of night…a book held by their dad, who always squishes himself into the middle of the chaos and reads to them before bed. How many times have they crowded around him, around this book, laughing and soaking up the words I loved as a child? This book, like so many others that line our shelves and sit in stacks on our floors and under our bedside tables, has been dearly loved. Its words have been treasures to me for years. 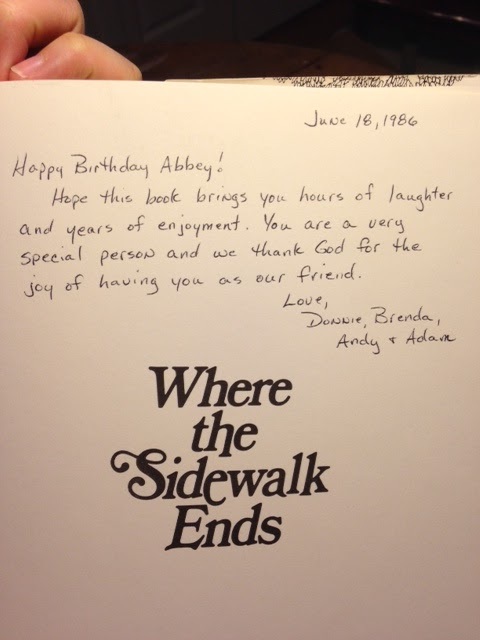 Right here, right in the front, is the inscription from my friend Brenda on my seventh birthday…and now my almost-seven-year-old is throwing his head back and laughing at the same poems I’ve loved. What’s going on here is a lot more than messy. It’s life. There’s so much good in it. And if things are a mess, they’re a beautiful mess, because the mess is proof we’re alive. We are right in the middle of the #365picturebooks challenge dreamed up by StrongHaven (just finished number 125/365). Somehow, it was easier to devour piles of books when the weather was chilly and unpleasant for playing outside. 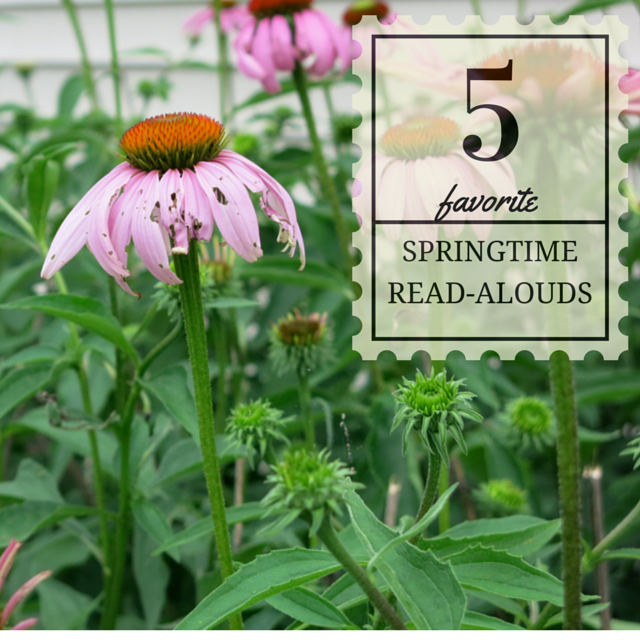 Now that spring seems to be here in earnest, we are outside most of the day, and I’m having to work harder to keep our read-aloud streak going. It’s one of those things- as soon as we find a time slot for reading aloud that seems to work perfectly, something changes, and we have to renegotiate. I haven’t found the perfect spot in our day for reading aloud now that everyone wants to run outside as soon as they finish breakfast (and sometimes even before…Sam has been taking his breakfast out onto the deck if the temperature is above 45 degrees). We can do the before bedtime slot, but I sometimes miss that because of putting the baby down to sleep, so George gets all the fun. I might try reading while they eat breakfast today. One of my favorite things about this challenge has been finding new books at our library. We have a large collection, but there are not enough to add up to 365 picture books, even if we read every single one we own. Today, I wanted to share some new picture books we have discovered. While I always go back to read our perennial favorites over and over again, we have been enjoying some new finds from the library that are so seasonally appropriate, I just have to share them with you (in case you haven’t run across them yet). Heads up, local friends- I’m running these back to the library this week, so if you hurry, you can be the next to grab them! and then it’s spring by Julie Fogliano is the story of waiting for things to be green. It is so beautifully written and illustrated (by Erin E. Stead, who is wonderful at capturing the essence of what it feels like to be a little kid) that it is nearly perfect. There is nothing more to say. You have to read it, and I need to buy it, because I never want to return it to the library. My Garden by Kevin Henkes is a new favorite around here. It is exactly as it should be. A child helps her mother in the garden and dreams of the garden she would create if she could grow anything she wanted. This has led to some interesting discussions here and drawings of gardens growing light sabers and ice cream cones. I’m planning to use the concept as a writing prompt for the kids in the next couple of weeks as we work on our own garden. Outside Your Window by Nicola Davies is a new collection of original poetry for the seasons. There are poems and gorgeous illustrations for every season of the year, so it isn’t (strictly speaking) just a spring book. Maybe it was the cover that pulled us in (since Lucy is currently fascinated by birds)- I’m not sure- but I am so glad we brought this one home from the library. The poems are simple, lovely and relatable- if you are intimidated by reading poetry with your kids, this book makes it easy. This would be a good choice to add to your family library and keep out all year long…but since spring is the first season of the year, now is a perfect time to start! I now have it in my Amazon cart and am just waiting for the right moment to buy it. Linking up today with Rachel for Five Favorites, because sometimes good things come in fives. Those are all Amazon links, so if you click through and end up purchasing any of these, your purchase helps support this blog (at no extra cost to you). Thanks for those of you that do that sometimes! The summer solstice is here…which means our nights are bright until well after 9:00 pm. The sun comes up bright and early, too, working its way into the children’s east-facing windows despite the blackout curtains that line them. We have all the good stuff…room-darkening shades, clips to hold the curtains together, white noise machines, and snuggly, comfy beds. Still, though, one of our three (want to guess which one?) refuses to sleep at night until it is dark and cannot seem to stay asleep if there is any light in the sky at all. We’ve found it works better to try to extend the bedtime ritual in positive ways when we know SuperSam isn’t ready for sleep. We often read an extra book or tell an extra story. If he’s not sleepy when we leave, he has the option of lying in bed and reading to himself until he falls asleep. Sometimes he reads for over an hour. Although I wish he were sleeping, this staying up late for extra books with us and then having quiet reading time is a lot better than the way we used to do things, which resulted in his coming out of his room 6, 7 or 8 times after we had tucked him into bed…totally frustrating for everyone involved! This one is a classic. It’s great fun to go through the animals with a young child and make all the appropriate sounds. The verse is so pleasantly rhythmic…there’s some rhyme, but not enough to be annoying. We always speculate about where the children might be (“in this story the children are away/Only the animals are here today”), and SuperSam changes the part about the weather vane to “a golden flying pegasus.” Since it makes him oddly happy to do this, we never correct it, and the Sisters have learned it that way. The pictures by Felecia Bond are beautiful and realistic (the animals don’t look like cartoons- a pet peeve of mine! ), and the final pictures of the moon floating in the washtub full of water always take my breath away a little bit. This isn’t a single story, but a collection of poems, prayers, songs, stories and recipes for bedtime snacks. There are even instructions for making shadow puppets with your hand on the wall. 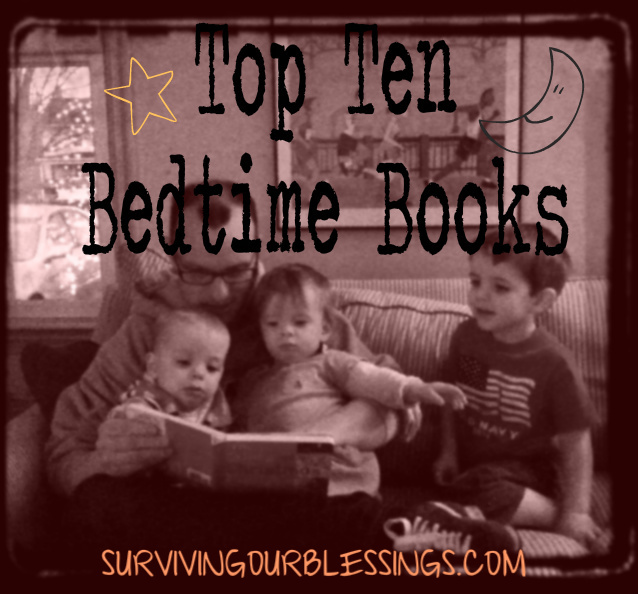 If you don’t have a bedtime ritual that you’re happy with, or if you’re looking to add some things to the bedtime routine at your house, you might get some good ideas from this book. It includes classic as well as modern tales and songs, and the poems are drawn from different cultures and traditions. This book contains several great songs for singing before sleep that I just hadn’t thought of on my own- songs I’ve always known, but have never considered as lullabies. My children particularly like “Moon River” by Henry Mancini and “Dream a Little Dream of Me” (I think I sing it a little like Mama Cass). The gorgeous illustrations alone are enough of a reason to have this book in your collection. Try the preview feature on amazon.com to get a sneak peek at some of them. Although I believe we can never have enough poetry in our lives, I’m guilty of getting caught up with reading story after story and forgetting to read poems (despite our healthy poetry collection). This book contains poems chosen by Jane Yolen and Andrew Fusek Peters for their sleep-inducing qualities. SuperSam enjoyed the shorter poems even as a toddler, and now that he’s older, he will often ask to read ten or twelve in a row. There’s something about the carefully-chosen words and the charming illustrations that makes this feel like the perfect bedtime book to snuggle up and read together. Plus, it’s easy to agree to “one more poem? pleeeeease?” even when you are tired- they’re so short that reading lots of them takes little effort. A new favorite at our house, especially with the Sisters, this book goes through parent-child pairs of animals with each parent telling the baby that it is time to go to sleep. It rhymes, but not in a sing-songy way. I like that the animals represented go beyond the usual suspects- there are fish, bumblebees, and even snakes involved in the story. My favorite part is when the mama cow asks her baby, “What happened today that made you laugh?” and both of my girls laugh loudly in a very theatrical kind of way. We’ve been reading it nearly every night. We ran across this book years ago at our local book fair and loved it. It’s musical from start to finish. The story is about a young boy who goes through his day from morning until bedtime hearing music in all the ordinary sounds around him: buzzing flies, chattering squirrels, whistling daddies coming home from work, cooing baby sisters being put to bed. He’s an adorable little boy- you will love him, I promise. If it can work on a surly teenage boy, it can probably work on anyone. Thanks, SuperSam, for taking all the mystery out of it. Sigh. This book has been on my list for a long time, but we only got a copy recently. It seems to be out of print, maybe (? ), but there are lots of good used copies available. The last page of this book is included as a poem in Switching on the Moon, above, and we loved it so much that we knew we needed to read the rest of the story. Mary Ann Hoberman goes through a child’s day naming all the cozy things you could possibly think of (and some that you probably couldn’t think of). It’s a longer read, and she might define “cozy” a bit differently than I would (I would probably not describe sucking on an ice cube as “cozy”). Still, the book and all the many images in it are very happy, simple pleasures- experiences that most of us can relate to enjoying. Hoberman obviously loves words- the language is delightful. The writing and the pictures make me smile every time, and the poetry of the last page is the perfect ending for a going-to-bed book.